Tech startups are making human life easier. Startups have the advantage of being agile. They are capable and comfortable to explore and swiftly adopt latest technologies into their work, unlike large enterprises that are reluctant or unable to alter their business models. This very nature has enabled tech startups to disrupt the way different industries operate including manufacturing, logistics, IT, retail, energy, healthcare, finance, and more. They enhance enterprise efficiency and drive revenue, identify and address unseen problems, and expand value delivered to customers. Coming to the aid of the aging population, health tech startups are facilitating the convenient delivery of required medication to the homes of senior citizens. Fintech startups are offering innovative payment platforms to their users with advanced security. In the energy sector, there are players developing decentralized solar home systems in rural communities to deliver sustainable sources of energy. Tech-savvy startups are leveraging artificial intelligence, Internet of Things (IoT), robotics, and blockchain to further benefit the industries they cater to. A distinguished selection panel comprising CEOs, CIOs, VCs, and the CIOReview magazine’s editorial board has selected a list of the most promising tech startups across industries that leverage innovative technologies and strategies to enhance services of today's modern enterprises. 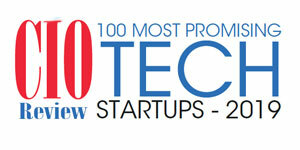 We present to you CIOReview's "100 Most Promising Tech Startups - 2019."